Luceco has recently lit new parking facilities in Telford with Climate Extra, an IP65 rated LED energy efficient luminaire. The International Centre in Telford is one of the UK’s leading international events venues, attracting over a quarter of a million visitors every year. 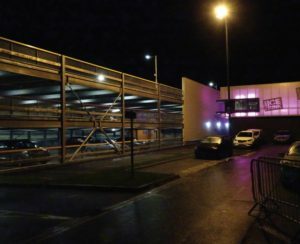 Telford International Centre has built the new six level multi-storey car park on three floors with room for 300 vehicles, on land beside Telford Town Ice Rink. Climate Extra is a robust LED IP65 rated luminaire offering a market leading efficacy of 140 Llm/cW and 50,000 hours operational life with increased performance for improved energy efficiency. This cost-effective luminaire is available with integral microwave sensors in on /off or 10% corridor function or batten fit PIR sensors as well as DALI drivers and emergency back-up variants including Self-Test. An opal diffuser enhances appearance and uniformity. Polycarbonate construction with stainless steel anti-tamper clips ensures a sturdy luminaire that is a cost-effective alternative to traditional fluorescent luminaires previously used for many industrial applications including car parks. The new car park at the International Centre has been designed with “smart glass” technology, which allows the outside of the building to change colour. 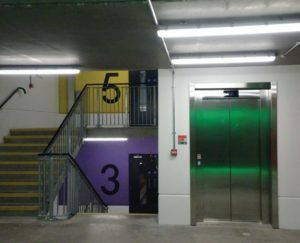 As well as its colour-changing outside panels, the car park has also been designed with no structural load-bearing columns to make the most of available space inside. 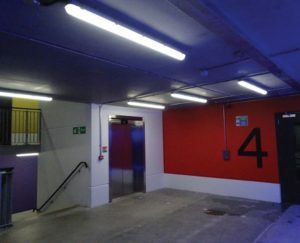 The parking facilities also benefits from the huge advantages of LED energy efficient luminaries, providing cost effective, durable and safe lighting to meet the demands of any commercial environment.